Give him credit. Most elected officials are content to tinker at the edges, but Governor Jindal of Louisiana actually wants to solve problems. Look what he’s done, for instance, on fiscal policy. He sought to abolish his state’s personal income tax, a step that would have dramatically boosted the states competitiveness. That effort stalled, but he actually has been successful in curtailing state spending. 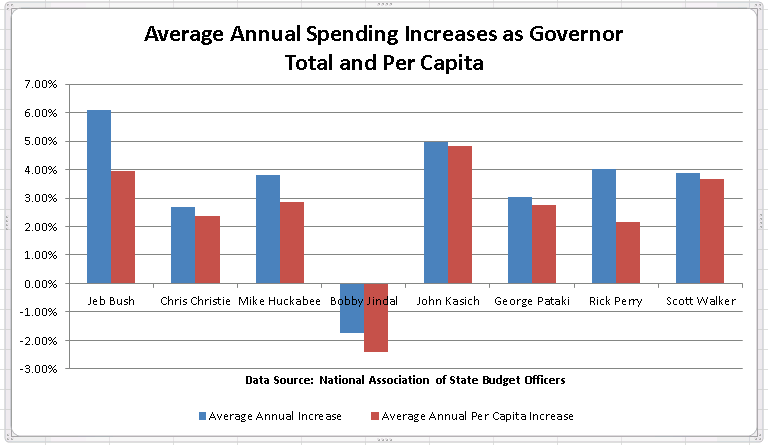 He’s amassed one of the best records for frugality of all governors seeking the GOP presidential nomination. And he’s now joined the list of presidential candidates seeking to rewrite the internal revenue code. Since we’ve already reviewed the tax reform plans put forth by Rand Paul, Marco Rubio, Jeb Bush, and Donald Trump, let’s do the same for the Louisiana governor. Regular readers hopefully will recall that there are three big problems with the current tax code. High tax rates that undermine incentives for work and entrepreneurship. Double taxation of income that is saved and invested, reducing capital formation and wages. Loopholes that hinder economic efficiency by distorting the allocation of resources. Let’s see whether Governor Jindal’s plan mitigates these problems. On the issue of tax rates, the Louisiana Governor replaces the seven rates in the current system with three rates, starting at 2 percent. And instead of a top rate of 39.6 percent, the maximum penalty on work and entrepreneurship would be 25 percent. He also abolishes the marriage penalty and gets rid of the alternative minimum tax (a perverse part of the code that forces people to calculate their taxes a second time, based on a different set of rules, with the IRS being the only beneficiary). Regarding double taxation, one of the big problems in the current system is that corporate income is taxed at both the business level and the shareholder level. Most proposals seek to fix this problem by reducing or eliminating the tax burden on dividends on households. Governor Jindal, by contrast, would keep that tax and instead abolish America’s corporate income tax, which is probably the worst in the world. In one fell swoop, that bold piece of reform also solves many other problems. You don’t have to worry about the tax bias of depreciation. You don’t have to worry about the anti-competitive policy of worldwide taxation. And you wipe out a bunch of corrupt tax preferences. The plan also would create universal savings accounts that would be free of double taxation (a policy that has been very successful in Canada). Jindal’s plan also eliminates the death tax, though there would still be a capital gains tax. Shifting to loopholes, the disappointing news is that the charitable deduction is untouched and the home mortgage interest deduction is merely trimmed. But the positive news is that the state and local tax deduction apparently goes away. And because the abolition of the corporate income tax automatically gets rid of the loophole for fringe benefits such as health insurance policies, the Governor also proposes to create an individual deduction for those costs. The net effect of all these changes is that the tax code will be far less punitive. The Tax Foundation is the go-to place for analysis on the economic and revenue impact of tax reform plans. Here’s what they predicted would happen to the economy if Jindal’s plan was adopted. Now let’s end with two observations that may be more political than economic. First, Jindal’s plan is a huge tax cut. About $10 trillion over 10 years according to the experts at the Tax Foundation. In this regard, Jindal is in the same league with Trump, who also proposed a very large tax cut. Paul, Rubio, and Bush, by contrast, have much more modest tax cuts. This is a good thing, of course, assuming candidates have serious plans to restrain – and perhaps even cut – federal spending. I don’t lose sleep about whether there’s a balanced budget in year 5 or year 10, but a tax reform plan with a big tax cut isn’t serious unless there’s a concomitant proposal to shrink the burden of government spending. P.S. If you’re curious about Jindal’s position on other policy issues, he has a good track record on education. He implemented some good school choice reform, notwithstanding wretched and predictable opposition from the state’s teachers’ union. Income tax should be abolished. Any loophole will metastasize into the next lobbyist inspired loophole. You cannot eliminate the corporate tax and create untaxed universal savings accounts at the same time, without moving from double taxation to no taxation. The problem with dropping the corporate rate to zero is two fold. First, it becomes a tax dodge for high income earners. Why pay yourself a high salary and pay high taxes when you can reduce that tax burden by leaving it in the company. Since those with that flexibility currently pay the bulk of the taxes, tax revenues will disappear. Second, the corporation is the most efficient tax collection point. To eliminate double taxation, one can tax the corporation or their thousands of stockholders, each with varying incomes and tax status. Why burden those thousands, when collection can simply done at the corporation. If you are adamant about zero corporate tax, at least have the corporation collect withholding on dividends. Note that dropping double taxation will necessarily increase the tax rates on individuals or lower revenues. There are not 3 big problems with the current system, but rather 5. Missing is the cost of compliance. The IRS estimates that compliance takes 6 billion man hours. If a more efficient system could convert half that to productive time our national productivity would be improved by 1%, and that’s not even considering improved decision making. Our current system is holding back growth. Also, our means-testing support system must be integrated into the tax code to stop current disincentives. We are currently paying people not to work or to stop working before they lose benefits. Because this effects those at the bottom rungs of the income ladder we and they will never know what they might have accomplished without those barriers to higher achievement. Good heavens, someone who actually makes sense. Of the remaining Republican candidates, Bobby Jindal is perhaps closest to my own policy preferences, at least on matters of entitlements, spending, and taxes. Dan Mitchell takes a look at Jindal’s proposed tax plan and likes what he sees. So do I. Jindal likely won’t be the nominee, but it’s to be hoped he’s an important part of the next administration, assuming the Republicans win.